Very much a residential pub in Lower Clapton, and one well hidden from even the shoppers along Chatsworth Road, let alone Lower Clapton Road or central Hackney. However, there's a lively crowd of people who have discovered it and made it their home. For your efforts, they have six handpulls on the front of the bar. Timothy Taylor Landlord, Fuller's London Pride, Adnam's Broadside and Harvey's Sussex Best Bitter (£3.30) have been available in all the years Ewan has been visiting, and have never changed. They also had Doom Bar and a Weston's cider on the handpulls on a March 2013 visit. They have the standard lager options, Staropramen, as well as Hoegaarden and Leffe (though these have not always been well-kept in the past) and a passable wine list. However, there are tasty and good value bar snacks as well (cashews or olives for £1.60; peanuts or crisps 50p). The food menu is short and hand-written, with a burger (£5.50), vegetable curry (£6), grilled chicken and chips (£6) and crudites and dips (£4.50) on a March 2013 visit. Ewan tried the chicken, which was tender and nicely-cooked with some delicious roasted vegetables on the side, and good crunchy chips. As of December 2012, Hackney Citizen reports that there is also now a "food and craft cafe" on weekdays from 10am-3pm, run by local residents and offering home-cooked food including breakfasts. What this pub has especially in its favour is a great atmosphere, with beautiful wood panelling throughout and very friendly staff. There's a fireplace, but Ewan hasn't seen it in use photo of interior, though the place stays cosy via the radiators hidden away in the panelling. (Interesting music selection too, when they're playing music -- that depends on who's tending bar.) There are DJs and live (piano) music some nights, and a quiz on the first Tuesday of every month. Some boardgames are stacked on a windowsill (though I couldn't guarantee all the pieces are present), alongside a selection of dog-eared books should you be without a playing partner. There are some tables outside on the street under awnings for the smokers. The place is generally not too full, although gets busy on Friday and Saturday evenings. 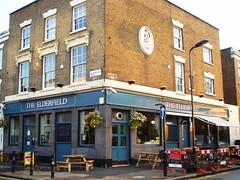 The Elderfield changed its name in September 2007 from the Eclipse (following a dispute with the chain of cocktail bars of that name over the other side of London). Its name before being known as the Eclipse was the Priory Tavern. Accessibility: Everything is on the same level, and there are no steps either to enter the pub, or to the toilets. Last visited by Ewan, Kat, Bec and others, March 2013. Opening hours and food times taken from Time Out website, June 2008. Last edited 2013-05-10 07:08:29 (version 30; diff). List all versions. Page last edited 2013-05-10 07:08:29 (version 30).